Local Ottumwa historian E.M. "Elsie Mae" Cofer has written the history of NAS Ottumwa in an excellent book titled “Carrier On The Prairie”. This 318 page volume is well documented and provides a wealth of detail into the building of the base, as well as all aspects of life at the Naval Air Station during World War II. Solidly researched facts and delightful anecdotes create a story that goes far beyond local interest. From the book dust jacket . . .
“Ottumwa, Iowa. Where on earth is that?” more than one sailor asked upon receiving his orders. Instead of heading for the Fleet as expected, he ended up in the middle of the country about as far from salt water as he could be. During the Second World War, NAS Ottumwa served as a primary flight training station. Naval aviators soared over lush com and oat ﬁelds in summer and braved Iowa’s frigid winters to learn to fly in open-cockpit Stearman biplanes. Nearly 5,000 cadets and officer trainees completed primary training in Ottumwa. A future U.S. President and some of the first female aviation machinist mates in the nation were numbered among the naval air station’s population which averaged about 3,500. When the war ended, ﬂight training operations ceased, and NAS Ottumwa became a Pre-Flight training facility for another two years, closing in the fall of 1947. 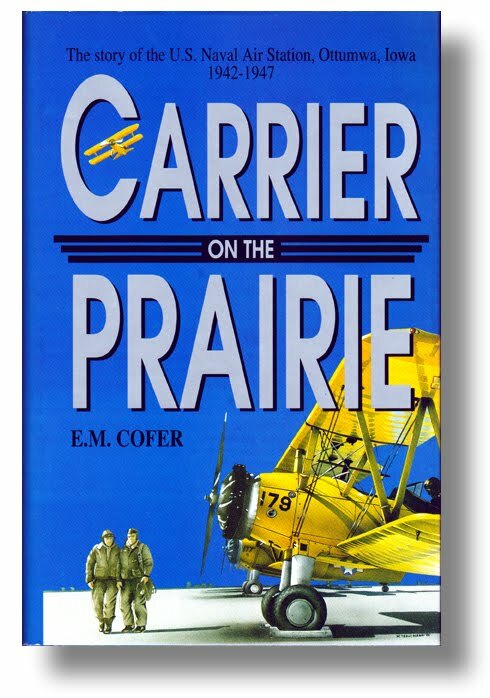 Carrier on the Prairie is the story of a Navy base and its association with a nearby Midwestern town as both deal with housing shortages, anxious wartime circumstances, youthful flying escapades, romances, flood fighting experiences, and rapidly changing political and moral viewpoints.